2. Tswalu Kalahari: understated luxury in the wild semi-desert. Enjoy the silence of this discreet eco-lodge where sunset on the red dunes has been the same for millions of years. Stunning location for the BBC documentary The Meerkats and home to the black-maned Kalahari lion. Need to know: Tarkuni is the Oppenheimers own personal home when at Tswalu. It may be booked for exclusive use and sleeps 10 - luxury family travel. 3. Samara Private Game Reserve: in the heart of the Great Karoo overlooking the Plains of Camdeboo near the historic town of Graaff Reinet. Go cheetah tracking or meet an aardvark. Bliss for kids with child-friendly rangers. The private Manor House offers absolute privacy and the newly opened Mountain Retreat is a romantic stone hideaway. 4. Londolozi Private Game Reserve Reserve in the heart of the Sabi Sands. World famous for its leopard sightings. Owned and run by the Varty family who are passionate about conservation. Ideal for a sophisticated family safari. For romantic luxe book the Private Granite Suites. A luxury African safari at its best. 5. 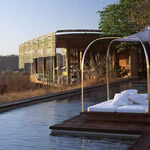 Royal Malewane, within the Greater Kruger Park: for the ultimate spa safari. Colonial styled interiors for only 20 guests or book the exclusive-use, East-African inspired Africa House for only 12 guests. Experience pure pampering at The Waters of the Royal Malewane Spa. Quintessential African safari holiday. 6. Pafuri Camp in the less-explored and more remote northern Kruger is a great self-drive choice with walking trails as an option. Must-see: prolific bird life, the eerie colouring of the fever-tree forests and the Luvuvhu gorge. A biodiversity hotspot. Reasonably priced for an African safari experience. 8. Gorah Elephant Camp: the only private concession in the middle of Addo Elephant National Park, Gorah is also malaria-free. Eleven colonial- styled tented suites and known for its friendly staff. Goes without saying that you�ll see plenty of Ellies. Close to Port Elizabeth and other well known camps such as Shamwari, Kwandwe and Kichaka. 9. Sibuya Tented Camps near Kenton-on-Sea: Robinson Crusoe style camp only accessed by a 10km boat ride through pristine riverine forest. River Camp has recently been refurbished and is heaven for families looking for a relaxed African Safari travel adventure that�s close to the Garden Route. Game drives, canoeing, fishing, walks and loads more for active children. Best-kept secret: their day trips (including a river cruise and game drive).